Rise = X 2 X 12 = 6 in. Table II gives the rise per foot of run for the common pitches. 1. Ikying out the work line. 2. Marking the ridge cut or upper plumb cut. 3. Determining and marking the length of the main part of the rafter. 4. 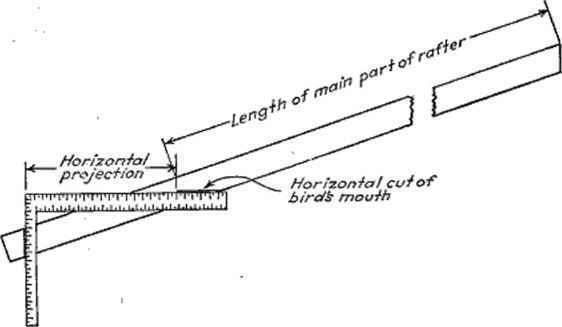 Marking the bird's mouth. 5. Marking the length of tail. 6. Shortening the rafter for the ridge board. 124. Marking the Ridge or Upper Plumb Cut.—This is done by placing the square near one end of the stock (Fig. 98) with 12 on the body and a number on the tongue that corresj>onds to the rise per foot of run, coinciding with the work line (or one edge of the rafter in case no work line is used). A mark along the tongue will give the line for the cut. 125. Determining and Marking the Length of Main Part of Rafter. Method 1. 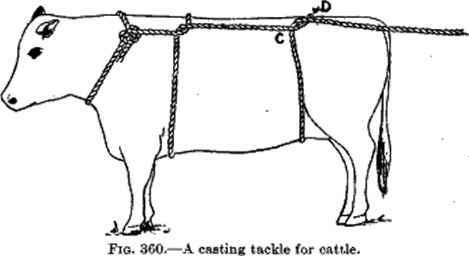 Scaling.—Place the square on a piece of stock having a straight edge, using the side of the square with the inches divided into twelfths, and measuring the rise on one leg and the run on the other, to the scale of 1 ft. equal to 1 in. (Fig. 99). The figures on the legs of the square should coincide with the edge of the stock. Mark along the legs of the square with a sharp pencil or knife. Measure the distance between the intersections of these marks with the edge of the stock. Tliis is the length of rafter to the scale of 1 in. equal to 1 ft. The inches and twelfths of inches on the square are simply read as feet and inches. For example, to determine the length of a rafter whose run is 10 ft. 6 in., and whose rise is 5 ft. 3 in., set the square with 10*^2 in. on the body and 0^2 in. on the tongue coinciding with the edge of the stock, and scribe along both sides of the square (Fig. 99A). Measuring the distance between the points of intersection of these marks with the edge of the stock, we find it to be 11% (Fig. 99£). The rafter length is therefore 11 ft. 10 in. Flo. 98.—Marking the upper plumb cut. Method 2. Use of Rafter Table.—Probably the simplest method of determining the length of a rafter is to use a rafter table. Figure 100 shows such a table on a rafter or framing square. 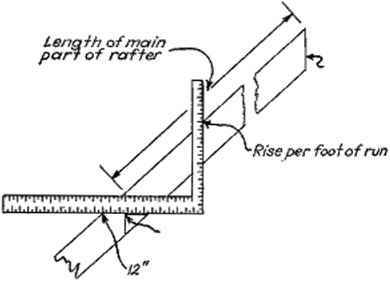 To use it, proceed as follows: Determine the rise per foot of run for the particular rafter to be marked out. Find this figure on the body of the square. Under this figure will be found another figure which is the length of common rafter per foot of run. Multiplying this figure by the total feet of run in the rafter gives the total length. 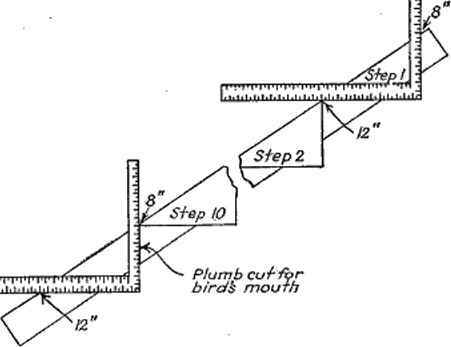 For example, to determine the length of a quarter-pitch rafter having a run of 10 ft., look under 6 on the body of the square (6 being the rise f per foot of run for quarter-pitch rafters) and find the figure 13.42. Multiplying this by 10, we get 134.2 in. Reducing to feet, we get 11 ft. 2.2 in., or for practical purposes a little less than 11 ft. and 2*4 in. fractions are involved. If such a square is available, 2.2 in. may be measured off directly. Most squares also have a hundredths scale, which is 1 in. divided into 100 parts and from which decimal fractions of an inch may be measured off with a pair of dividers. The hundredths scale is located on the back of the square near the junction of the body and the tongue. Fio. 100.—Rafter tabic on a rafter ¡wiuare. Method 3. Stepping Method.—To use this method take 12 on one leg of the square and the rise per foot of run on the other and place the square with these figures coinciding with the work line (or one edge of the rafter). Carefully mark along the body and the tongue of the square, using a very sharp pencil. This marks off one step on the work line (or edge). Move the square along the stock and repeat, taking as many steps as there are feet of run in the rafter. Another variation of this method is to use a number in one leg corresponding to the total feet of run, and a number on the other corresponding to the total rise, and to take 12 steps. Unless the work is done very carefully there is a chance for errors in marking when the stepping method is used. 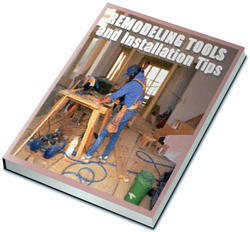 For this reason, many good carpenters do not use it, or if they do use it, it is as a check upon some other method. Fto. 101.—Determining the length of a one-third-pitch rafter whose run is 10 ft., usgng the stepping method. This method gives accurate results but requires considerable involved computation with the possibility of errors in arithmetic, or the use of tables of square roots, which are usually not available. This method therefore is seldom used by practical carpenters. Fro. 103.—Marking of! the rafter tail. (or through the intersection of the plumb line and the work line) (see Fig. 102). If the bird's mouth notah as marked out is so deep as to weaken the rafter, or if it is so shallow as to give inadequate bearing on the plate, the depth should be varied somewhat to give stronger construction.